The final static firing by Nammo of a rocket motor has scored a new record for Norway and demonstrated Europe’s lead in hybrid launcher propulsion — the hybrid motor was connected to tanks, valves, and piping on the test bench, representative of the flight setup. Over a burn time of about 40 seconds, the motor generated 30 kN of thrust, an equivalent of over 40 kN of thrust in vacuum. This is enough to propel a sounding rocket past the edge of Earth’s atmosphere to an altitude of over 100km — a first for a European rocket with hybrid propulsion. 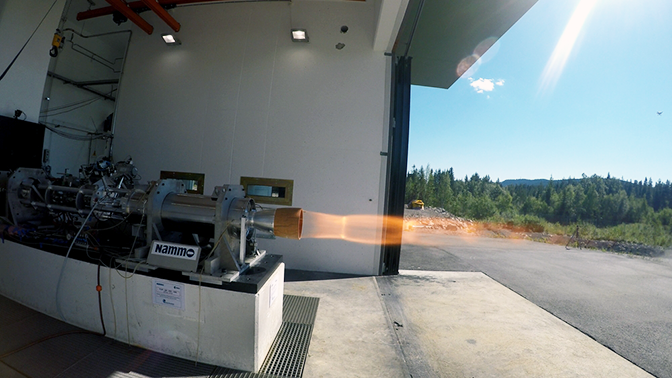 The hybrid rocket motor during a static firing test. Photo is courtesy of Nammo. Nammo partnered with ESA to develop the technical building blocks for future launch vehicles by combining the simplicity of solid propellant with the versatility and controllability of liquid propulsion. Nammo’s hybrid motor will power the ‘Nucleus’ sounding rocket due for a technology demonstration suborbital launch at the end of this year from Norway’s Andøya Space Center. It will be the first flight for Nammo’s hybrid rocket technology and the first step in the development of the North Star Rocket Family. This Norwegian initiative aims at developing a family of sounding rockets and possibly a small launcher capable of placing small satellites in orbit from the north of Norway. Sounding rockets offer an inexpensive ticket to the edge of space for small experimental payloads or new hardware. Most sounding rockets use solid propellant because it is relatively cheap but its drawback is toxicity, and once ignited, it cannot be switched off. Instead, Nammo’s hybrid motor uses highly concentrated liquid hydrogen peroxide as the oxidizer, which reacts with a rubber-like fuel. Cost savings have been achieved by buying in components, and serial production methods. The propellant and oxidizer are safe to handle and the byproducts of combustion are mostly water and carbon dioxide – making it environmentally friendly too. The motor can be restarted and the thrust profile can be matched to mission requirements. The next step is to integrate the motor with the fuel tanks and the payload of the Nucleus sounding rocket. The 800 kg. Nucleus is 9 meters long and has a full-burn capability of more than 40 seconds. Proving the design and technologies on this demonstration flight is an important step towards using hybrid propulsion on micro-launchers. For greater performance, single motors can be clustered while using a common oxidizer supply. In addition, a future version of the motor is planned to have an increased thrust of 75–100 kN, harnessing advanced turbopump technology. Europe's hybrid motor technology offers propulsion solutions to small launch vehicles in the fast-growing smallsat market.